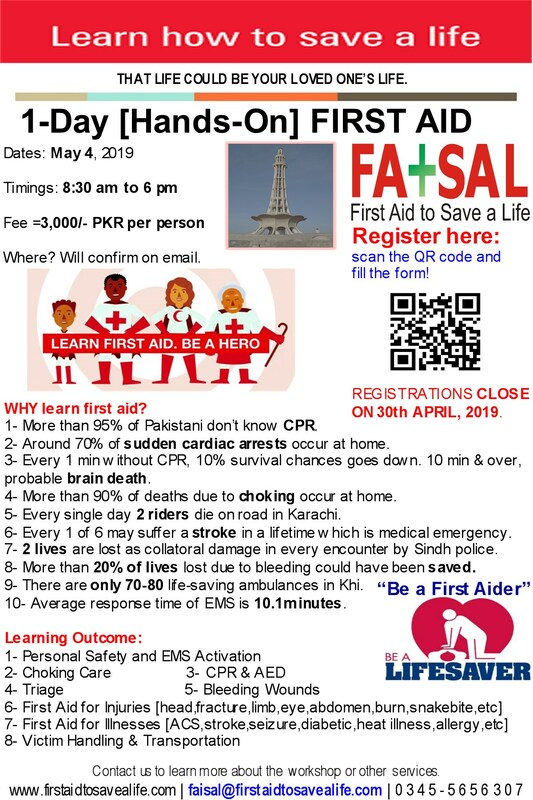 First Aid to Save a Life (FATSAL) Pakistan is pleased to announce 1-day “CPR, AED & First Aid” International Training Certification by MEDIC First Aid International in Lahore on August 5, 2017. This is a registered training course and globally recognized. This training program is designed specifically for the occupational first aid provider and fulfills industry requirements. The course is based on the current guidelines for CPR and First Aid. Kindly remember that we have limited seats available in each course so don’t wait for last week and finalize your registration as early as possible to confirm your participation. Kindly visit our upcoming trainings page for more comprehensive details and/or our online registration page. Do let us know if you have 1o or more number of delegates to be trained in one city and we can join you there to run the session for your organization. Everyone likes to think they are different. We are the same but let me assure you its not just talk. Frankly we try much harder to offer a more attentive, imaginative and enhanced and credible learning experiences. 1:- Professional adult and infant CPR-AED training manikins (with CPR monitor) for realistic experiences and feedback. 2:- Professional anti-choking manikins for lifelong learning experience. 6:- Snakebite First Aid kit for demonstration and practical. 8:- Stretcher for patient transfer/management exercises. This entry was posted in First Aid CPR and AED and tagged accredited training program, advance first aid, AED, automated external defibrillator, basic first aid, basic life saving skills, control of bleeding in snakebites, conventional CPR training vs online CPR class, CPR, cpr trainings in lahore, first aid training courses in lahore, first aid training providers, first aid trainings in islamabad, first aid trainings in lahore, Hands-Only CPR, HSE courses in pakistan, hse training courses in islamabad, hse training courses in karachi, hse training courses in lahore, medic first aid, medic first aid institute, MEDIC FIRST AID training programs, MEDIC First Aid USA, Pakistan, sudden cardiac arrest, training course, training program, trainings. Bookmark the permalink.